At 1:27 p.m., when my friend Matt still hadn't shown up for our one o'clock lunch plans, I figured he was lost. I imagined him steering his motorcycle around and around Essex Junction's busy Five Corners intersection in search of Pork & Pickles Barbeque, the newish restaurant where we'd planned to meet. He doesn't carry a cellphone, so I hoped he'd be resourceful, ask someone for help and wander in. Meanwhile, I sat in the cool, comfortably dim dining room sipping freshly squeezed lemonade through a blue-and-white paper straw. I daydreamed about the rich flavors of the smoked polenta I'd eaten on my visit the previous evening. I doodled pictures of pigs in my notebook. And then I got a call from Matt, saying he'd gone home because he couldn't find the place. 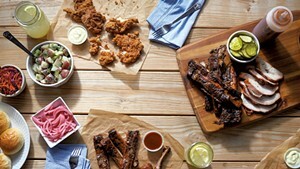 P&P, which opened in June, is an addition to the Lazy Farmer "farm to trailer" food truck and catering company. 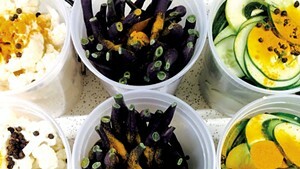 Chef-owner Chris Simard is known for his flavorful street food, such as kimchi tacos, lobster rolls, ramen and banh mi. During the food truck's tenure, he has used meat from Misty Knoll Farms, Boyden Farm and Snug Valley Farm in Hardwick. On more recent Lazy Farmer menus, Simard has taken to noting that all ingredients are locally and ethically sourced, rather than listing the names of individual farms. I'm fairly fanatical about good barbecue, and I appreciate it even more when it shows up in a town where a Vermont food booster might not expect it. So I'd been looking forward to dining at Pork & Pickles. Located off Route 2A in a building that also houses a used clothing store and a bakery, the restaurant is hard to spot, but our server mentioned that a sign is coming soon. That's good, because hungry diners should be able to easily discover and enjoy this place. After searching for better directions, Matt headed back. Meantime, I reexamined the brief lunch menu and ordered a pulled-pork sandwich with braised greens ($12) and a fried chicken sandwich with potato salad ($12). Both arrived just a few moments after he walked in. Our sandwiches were served on the kind of soft, sweet rolls that are perfect foils for meat and tangy sauces. The pork came with a mound of crunchy red-cabbage coleslaw and tender, flavorful braised greens. The coating on the fried chicken was perfectly crisp, the meat inside tender and juicy. But it could have used a touch more seasoning. The same almost-there quality had been true of many dishes the previous evening. Sitting outside under umbrellas that deflected the heat, two friends and I sampled a significant number of items from the much larger dinner menu. We began with Simard's famous pork-belly lettuce wraps ($5); wings, which were cleverly brined in pickle juice before being smoked ($6); and a plate of assorted pickles that included carrots, cauliflower, cukes laced with garlic and dill, and whole beets, plus jalapeño slices that were too spicy for any of us to eat ($5). 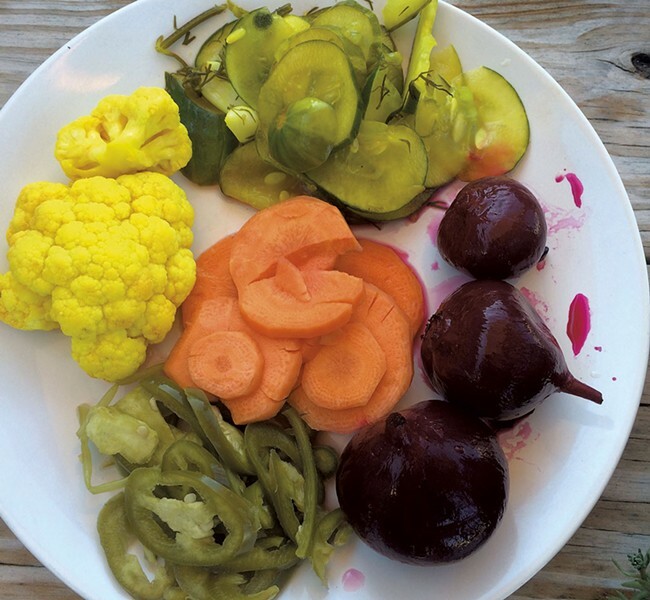 The pickles had a fun mix of textures, from the perfectly tender beets to the crunchy golden cauliflower. Both the wings and the wraps were delicious finger foods. The tender leaves of lettuce that enclosed the grilled pork belly were fresh and unmarred. 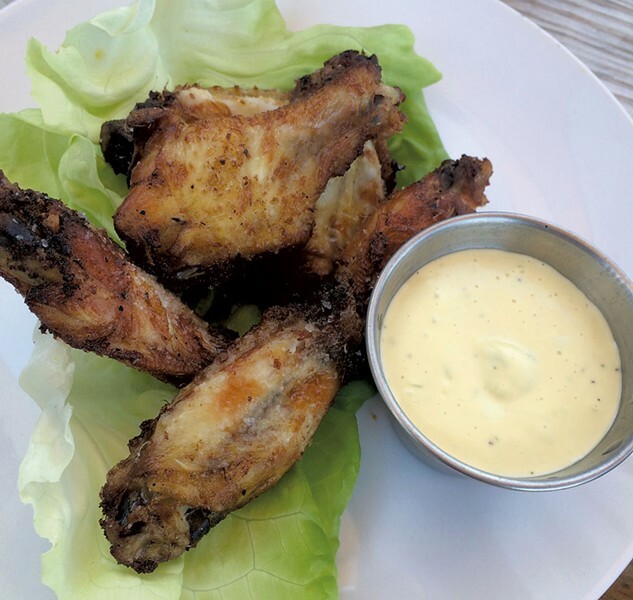 But the mayo-like mustard sauce that adorned both could have used more kick, more acidity. More, well, mustard. We moved on to entrées. 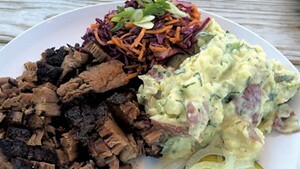 There was a pile of beef brisket accompanied with our chosen sides: coleslaw and potato salad ($20 for platter). The meat was smoky and tender but had less fat than I expect from a brisket. The slaw, which turned out to be my least favorite thing on the P&P menu, had nothing strictly wrong with it — the shredded carrots and red cabbage were fresh and nicely garnished with scallion — yet it was forgettable. Potato salad, which is surprisingly difficult to make well in quantity, was made well. Two barbecue sauces, put on the table to augment the meats, had a kick of vinegar, but both were on the thin side and didn't cling. I was more excited by the pork-rib plate ($18), to which we added sides of baked beans and corn bread ($3.50 each). The latter, made with Nitty Gritty Grain cornmeal and rather sweet, was delightful. It was browned on the outside without being overcooked on the inside, and was bursting with corn flavor. The stick-to-your-ribs-hearty baked beans were perfectly cooked and sweet, too. 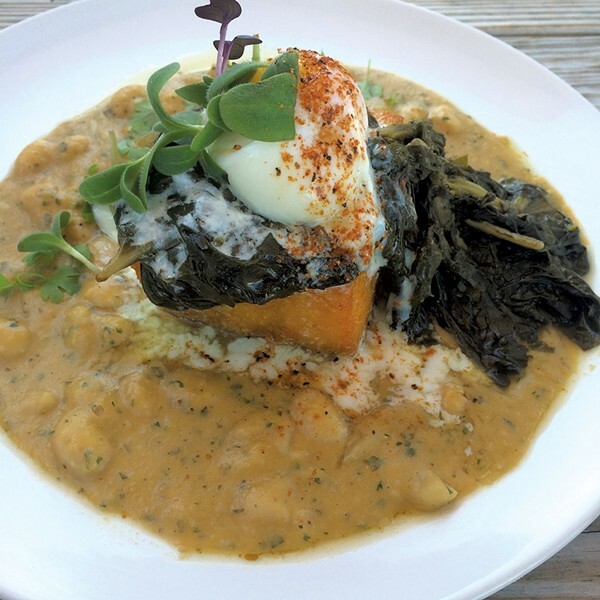 I'm an enthusiastic carnivore, and slow-cooked meats are high on my list of food turn-ons; thus, it surprised me that my favorite entrée of all was a vegetarian offering: smoked polenta over stewed white beans, with braised greens and a soft-cooked egg ($14). Every bite was bursting with flavor, and the textures played well together. It didn't need anything more, or different. We finished the meal with peach ice cream ($7) topped with pastry crumbles, whipped cream and slices of peach. 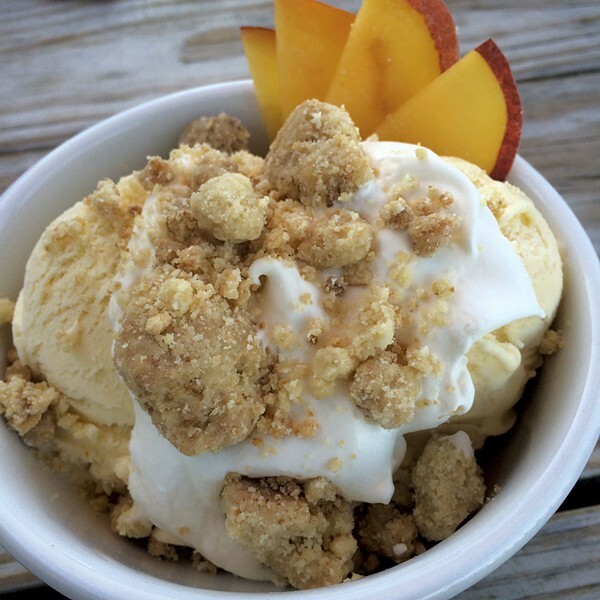 The ice cream was lovely and cooling and not too sweet; the crumbles added texture. Overall, it was creative and nicely executed. The day after I had lunch at P&P, I read a magazine article about my favorite chef, Thomas Keller (the French Laundry, Per Se). He related an anecdote in which, after a meal at a much-hyped New York City restaurant, another patron recognized him and approached. "Isn't this amazing?" the fellow asked. "No, it's not amazing," Keller said, "It's really good ... We need more good." As a former restaurateur, when I hired chefs, I asked them to strive to make each item the best version of that thing they'd ever tasted. Is this the best meatloaf? Is it the best blue cheese dressing? How about the best chicken stock? In many cases, the solution was just a little bit more lemon juice, a smidgen of spice, minced fresh herbs, a sprinkling of salt. 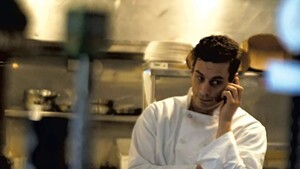 We sometimes failed in our quest, especially when we were extremely busy or, as restaurant people say, "in the weeds." 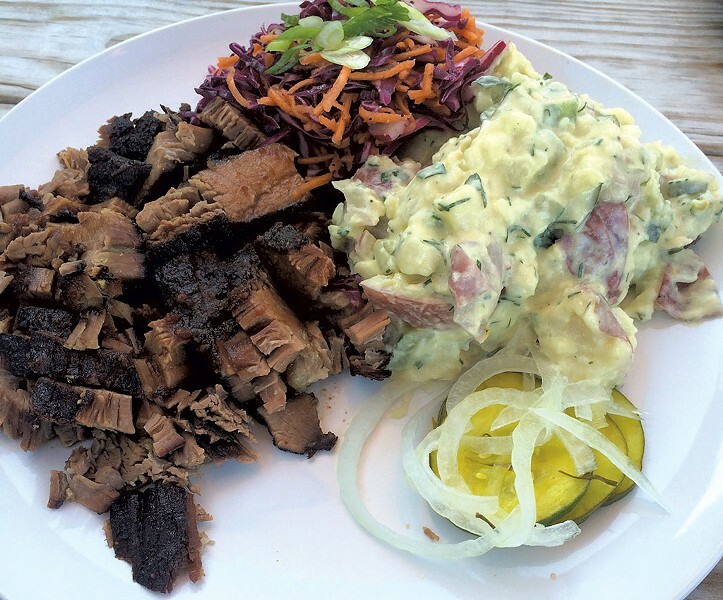 The food at Pork & Pickles could use that kind of refining. Sauces in particular, both the barbecue variety and the ones that are mixed into or accompany various appetizers and side dishes, could be punched up and made sexier. But for now, I can say that Pork & Pickles is good — really good. The original print version of this article was headlined "Almost Heaven"